Holy Trinity Episcopal Church announces the 19th annual Jazz on the Triangle series. This is a series of jazz concerts in April, May, and June. Nashville-based songwriter and jazz vocalist Sonja Porter Hopkins has a vocal texture that encompasses high spirited tones of nostalgic jazz. She has been singing since childhood growing up in Mobile, Alabama, she began her journey, as have many accomplished artists, in a small Baptist church. Sonja performed throughout her youth in many community events, college homecoming events and university pageants. Her passion for the arts and music continued to grow leading her to relocate to Nashville in 2001. Jody is a Nashville (and F. Scott’s) favorite as a pianist, vocalist, bandleader, composer, and educator. His Trio has just celebrated their tenth anniversary, and released a CD “Lights Will Guide You Home” in November. Hamilton Hardin is a multi-faceted musician who performs vocally and on multiple instruments, composes, does audio production, and offers clinics. His concert should be an exciting way to celebrate Father’s Day. Jazz on the Triangle is an annual series hosted by The Church of the Holy Trinity (Episcopal) located at 615 Sixth Avenue South in Nashville, in the lot bounded by Lafayette Street, Sixth Avenue, and Ewing Avenue. The concerts begin at 4:00 pm Central Time. Tickets are $20.00 each, or a set of three tickets may be had for $45.00. Refreshments involving beverages and light snacks are found in the Parish Hall, at the rear of the Church lot, prior to and following the Concerts. The Church of the Holy Trinity has a history as rich as the physical edifice in which it is housed. The Parish can trace its beginnings to a desire on the part of Charles S. Tomes, the then-Rector of Christ Church Episcopal for a “free Church” – one which would not depend on pew taxes for support. It was established in 1849 as St. Paul’s Mission on Summer Street, now Fifth Avenue. At this time, that address was in South Nashville, a town distinct from Nashville. Remember that this was in the pre-automobile era, and compare the relative locations of churches of other denominations – McKendree Methodist, on Church Street, Elm Street Methodist at Fourth and Elm, and Carroll Street Methodist, located on Carroll, and now, sadly, only a memory, having burned to the ground in the nineteen seventies. On May 7, 1852, Bishop James Hervey Otey laid the cornerstone of the present buildingThe building itself was designed to be evocative of an English Parish Church by the New York firm of Dudley and Wills, who were very active in this sort of design. It is said the church resembles one attended by the Reverend James Rogers, first Rector of the parish, as a child. Design features – native stone, and open-hammered ceiling beams are hallmarks of Dudley and Wills churches. The Reverend Charles Todd Quintard served as a supply priest to Holy Trinity in 1857 and as Rector from February 1858 until early 1859. He was later to succeed Bishop Otey as Bishop of Tennessee. During the years leading up to the Civil War, the neighborhood was recognized as “a section of refined, prosperous residents living in stately houses near the University of Nashville, noted for its distinguished medical facility.” One can find traces of this history on Second through Fourth Avenues in the Gaddes Fire Hall and in the Litterer Laboratory, to cite but two examples, along with the aforementioned Elm Street Methodist building, and a few of the “stately homes.”. In 1866 a new St. Paul’s mission was formed on rented rooms on Wharf Street. Having reached Parish status in 1892, it reverted to Mission status in 1876. A new pipe organ was built for the parish in 1872 or 1873 by the Pilcher firm of Louisville, Kentucky, and is noted in that company’s records as a “Model 5 with trumpet.” The tower was completed in 1887. 1894 saw the purchase of a “uniform set of pews.” Prior to that time, parishioners provided their own benches. The set of seats purchased in 1853 at the cost of $60.00 has disappeared, presumably during the War. The hand-carved pulpit is from another church in New York City. It was brought to Nashville in about 1935 by some Holy Trinity parishioners who found it in front of its original home, and rescued it for use at Holy Trinity. The double red doors were hung in 1952 as part of the Church’s Centennial Celebration. 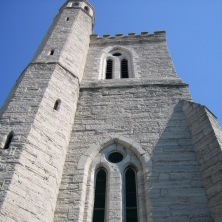 The Church was listed on the national Historic Register of Historic Places in 1972.